Prime Minister Narendra Modi today visited the country’s largest warship INS Vikramaditya off Goa coast in Arabian Sea, showcasing India’s naval prowess. Arriving on board the warship in a Sea King chopper, the Prime Minister was given the ceremonial guard of honour by the Navy and was briefed about the warship, which will be dedicated to the nation today. He also sat in a MIG 29 aircraft and had a feel of the combat fighter on the ship sailing off the Goa coast. The Prime Minister will spend a few hours on board the 44,500-tonne warship and is likely to witness a host of exercises by the frontline warships and aircraft. This is the new Prime Minister’s first visit to any defence installation. 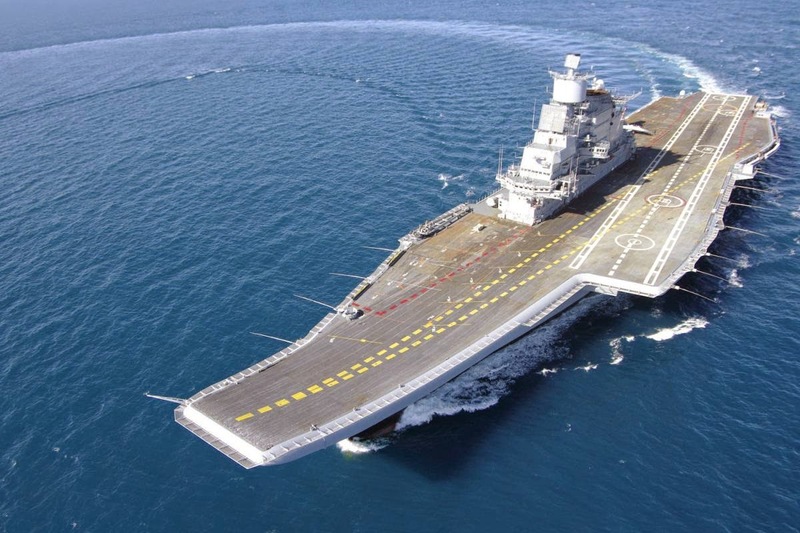 “My government is committed to One-rank One-pension,” said Modi on board INS Vikramaditya. “There were many promises on One-rank One-pension, but no action was taken,” he added. He further mentioned that the security of the country is his top priority. “We want to see eye-to-eye with the world. We don’t wish to threaten others, neither do we wish to bow down before others,” he said. During his stay on the ship, acquired from Russia for over Rs 15,000 crore, Modi would witness ‘air power demonstration’ by various naval aircraft, including MiG 29K, Sea Harriers, P 8I Long Range Maritime Patrol Anti-Submarine Warfare aircraft, TU 142M and IL-38SD maritime surveillance planes along with Kamov and Sea King helicopters. He will also witness high-speed manoeuvres by the Navy’s Western Fleet ships including aircraft carrier INS Viraat, Delhi-class destroyers and Talwar-class frigates. The Prime minister shall also witness the take-off and ‘arrestor wire landing operations’ and high-speed low-level operations of MiG29 K integral fighters planes on board the flight deck of Vikramaditya, officials said.